On average, it has generated €40-50m for shareholders over the past 10 years and has paid out 40% of it as a cash dividend. Return on equity is in the high 20s. Equity is leveraged approximately 2.5 times, but mostly thanks to trade payables, not debt. Tangible book value as of the third quarter of 2012 is €350m. 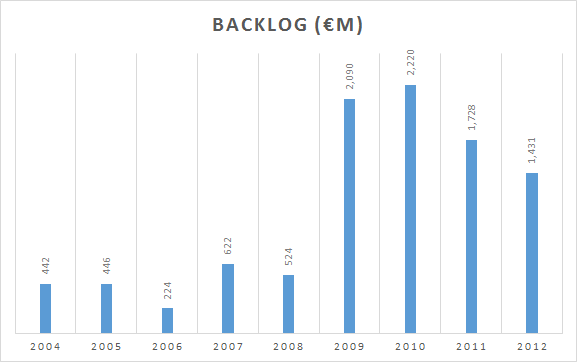 And to top it off, the company has a €1.4b backlog. In mid-2012, Mr. Market rushed to get rid of this company for €290m. I am bringing you another discarded Greek idea from last year. Just as with OPAP, the economic and political uncertainty overshadowed the low price at which the company was trading. However, as Buffett says, one pays a high price for a cheery consensus. The price has doubled since June 2012. Metal Constructions of Greece, or METKA for short, is the largest metal constructions complex in Greece and engages in big energy, defense, and infrastructure projects. It builds and maintains power plants in Europe, Turkey, North Africa, and the Middle East. It constructs defense systems for Raytheon and builds hulls for submarines. In addition, it manufactures heavy duty equipment such as mining equipment, harbor loading equipment, and refining equipment. As of last year, the energy segment constitutes 90% of revenues. 80% of the projects by revenue are abroad and they generate about 85% of net profit. Thanks to its export focus the company has managed to avoid the consequences of a shrinking Greek economy. METKA’s brightest prospects are in Turkey, Syria, and Iraq. Turkey’s growing population and urbanization likely make it the fastest growing energy market in Europe. It is building new power plants all the time and METKA already draws 30-40% of its revenues from Turkey. In the past 2 years, Syria, despite the mess this country is, has been the second largest market for METKA – very close in size to Turkey. Demand for electric power plants in the Middle East is strong with emphasis on mega-projects. Africa is also an attractive market, but so far the projects have been smaller. The euro amounts are the total values of the contracts METKA is involved in. These are large projects, handled by consortiums of companies. CCGT means Combined Cycle Gas Turbine – a type of power plant that combines two thermodynamic cycles, usually a gas and a steam turbine, to achieve about 50% higher thermal efficiency than Open Cycle Gas Turbine plants. 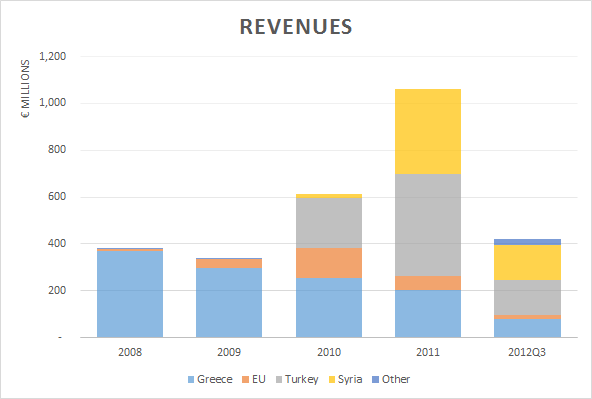 Syria seems like an awfully risky place to do business right now. These are long-term projects in a country with very dim long-term prospects. This was a major reason I passed on METKA back in 2012. I don’t think it is knowable whether the Syria projects will go through as planned. What attracted me to the company was that it had been growing and operating very profitably despite the dire situation in Greece. Also, METKA is majority owned (56%) by Mytilineos Holdings – a leading industrial conglomerate in Greece that traces its roots to a 1908 family-run metallurgy business. METKA’s Chairman and CEO is Ioannis Mytilineos. This gives it some of the benefits of a family-run business. Yet, the company was trading close to net current asset value. It was an interesting proposition but beyond my grasp. Below you can take a look at the financials.